The Unicorn won't fly anymore. Now it's time to dance on the Rainbow! Rainbow is a low-mid stretch Polyester Highline Webbing with some very special characteristics. Low stretch below 5 kN makes it very easy to rig. Mid stretch above 6kN makes it more bouncy, playful and easier to catch. Soft, round edges prevent slackrifice bruises and dual color design helps rigging the line without twists. When will you dance on the Rainbow? The Unicorn won't fly anymore. Let’s dance on the Rainbow now! 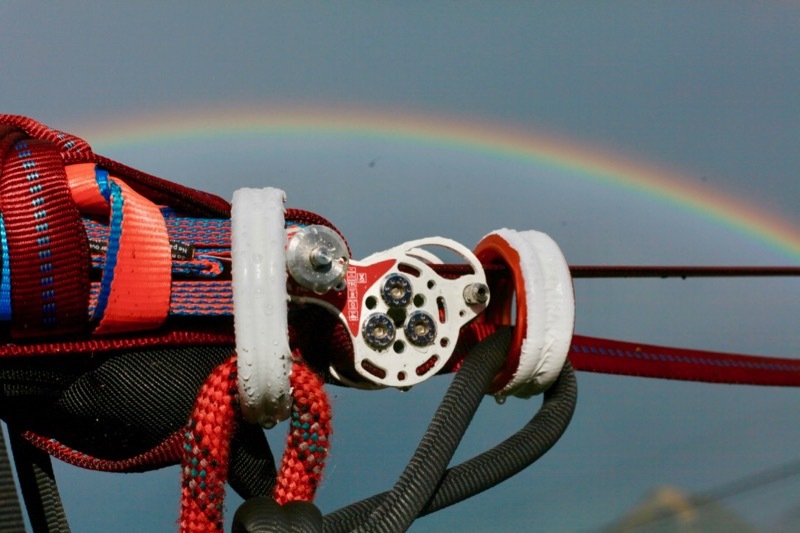 Rainbow is the next generation highline webbing. Its rounded edges and the tight weave make it feel very soft and smooth to your hand and feet. Take a look at the stretch characteristics: it’s easy to tension but still playful enough for nice surfbounces and bouncetricks. The dual color design helps you to prevent twists while taping and rigging. Rainbow is coated for protection against water, dust and dirt, so you will have long time fun with this webbing. CoreSheath Design: Rainbow is woven like a climbing rope with a strong core and a protective sheath. This makes it very strong and durable even under harsh conditions. Optimized Stretch: Rainbow is stretch optimized, so it's very easy to tension but yet very playful for all your bouncetricks and surfs. 62 g/m: The weight/strength ratio of this webbing is the current state of the art. You won't find stronger polyester webbings at this weight in the market. 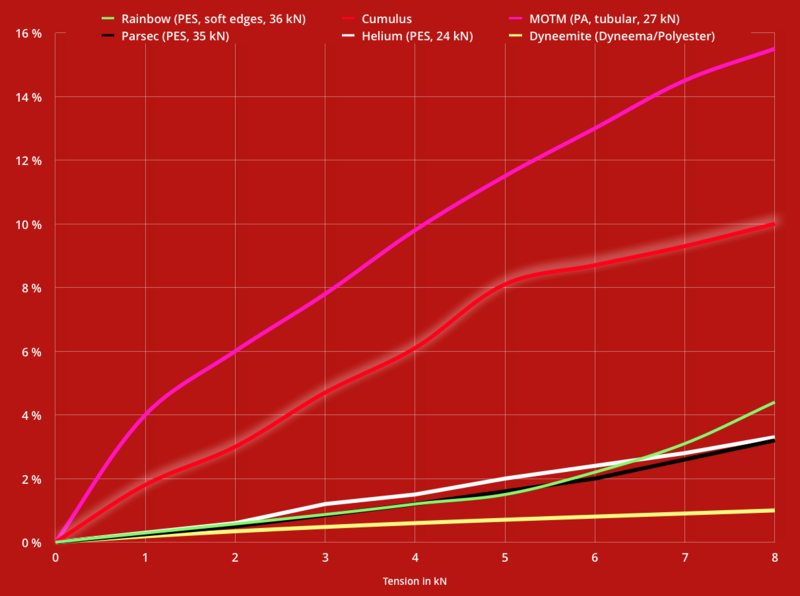 MBS 36 kN: Rainbow is strong. In all tensile tests it broke way beyond 37 kN. HydroShield: Rainbow webbing is coated, so it's well protected against the influences of water, dust and dirt. ThermaStretch: Rainbow webbing is heat set, to provide a very smooth and even stretch over all tensions. SoftEdge: Rainbow webbing has some special soft edge design. These soft and round edges are really nice to your feet and prevent slackrifice bruises from catching and climbing. You will feel the difference! AntiTwist Design: The dual neon color design of Rainbow makes it very easy to detect twists during taping or rigging. Easy Pretensioning: The soft weave and the innovative coating make it very easy to pretension Rainbow in your weblock. Made in Germany: All raed webbings are 100% made in Germany. We control every production batch by hand, so you can rely on flawless webbing pieces that fulfill the highest standards. Human & environmental friendly: All our webbings are compliant to the OekoTex 100 standard. This means they don't contain any substances that are known to be harmful to human or the environment. For highline or parc sessions just love this webbing, with a nice bounce and so soft thank you !! Your Rainbow webbing is pretty sick!